"This comprehensive work shows how endowments can provide multiple opportunities for donor involvement when the solicitation program is well designed and integrated with other fund development and program goals. Emphasizing the critical ethical issues inherent in marketing and structuring endowment gifts, it is an excellent reference manual and training guide." --Joanne Scanlan, PhD, Senior Vice President for Professional Development Council on Foundations, Washington, D.C.
"Endowment Building provides both practical, hands-on advice and a philosophical, inspirational framework to guide novice and experienced mission-based organizations. Given the demographic opportunities and challenges facing the nonprofit world, this book is a must-read." "A comprehensive guide on how to start, grow, and maintain an endowment. It shows how to put theory into practice with numerous real-life examples and success stories." "After you read this book, you will know what to do and how to do it. It is a wonderful tool for new and emerging community foundations!" 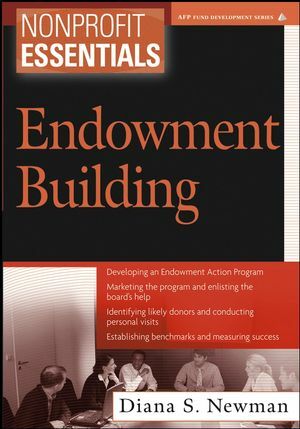 "Endowment Building is an insightful, succinct, easy-to-read resource on building successful endowment programs. It's a well-organized guide containing practical suggestions and reminders of things development professionals know but some-times forget." DIANA S. NEWMAN is founder and Principal of Philanthropic Resource Group, a Columbus-based, national consulting firm for nonprofit organizations. She has served as vice president for advancement at The Columbus Foundation and founding director of the Ohio Historical Foundation. She is also the author of the award-winning book, Opening Doors: Pathways to Diverse Donors (Jossey-Bass/Wiley). 2. Preplanning and Assessing Readiness for Endowment. 3. Developing the Case for Support and the Endowment Action Program. 4. Identifying, Cultivating, and Establishing Prospective Donors. 5. Managing, Investing, and Establishing Policies. 6. Caring for Donors and the People They Trust. Appendix A: Uniform Management of Institutional Funds Act (1972). Appendix B: Sample Questions for Prospective Donors. Appendix C: Model Standards of Practice for the Charitable Gift Planner. Appendix D: The Donor Bill of Rights. Appendix E: Sample Acceptance Policies for Endowment Gifts. Appendix F: Sample Investment Policies Template.